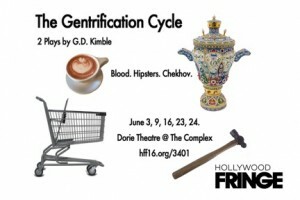 Samovar Subway Ensemble has announced a Hollywood Fringe Festival production of The Gentrification Cycle, two short plays written by G.D. Kimble and directed by Christina Cigala. Jen Tries Vacation and Locomotive Repair in Three Easy Steps will feature (in alphabetical order) Jon Gentry, Emily McLeod, Suzan Mikiel, Adam Tomei, Brian Wallace, Claire Winters, and Allison Youngberg. There will be five performances at the Dorie Theatre @ The Complex in Hollywood — Friday 6/3 at 7:30pm (press preview); Thursday 6/9 at 9pm; Thursday 6/16 at 7pm; Thursday 6/23 at 10:30pm; and Friday 6/24 at 6:45pm. Total running time will be 70 minutes. G.D. Kimble is an actor, playwright, and director. He is a native of Louisiana, where he was a founding member of both GreenDoor Productions and Pass-The-Hat Theatre. He has served as assistant director on Broadway for Terence Rattigan’s Man & Boy (2011) and Tom Stoppard’s Indian Ink (2014). Kimble is the author of several other plays including Megiddo, What Passes for Comedy, and The Girl from the Thing. After a successful run at The Glass Eye in NYC, his play Two Irishmen Are Digging a Ditch opened the Neil LaBute New Theater Festival in St. Louis. It later returned to New York for its off-Broadway debut. The creative team includes Brad Harris (set design and assistant director), Brandon Baruch (lighting design), Natascha Snellman (costume design), and James Ferrero (sound design). Fight choreography is by Dane Oliver, the stage manager is Erica Criddle, and Allison Youngberg is the producer for Samovar Subway Ensemble. Tickets for The Gentrification Cycle are $15 and may be obtained online at http://www.hollywoodfringe.org/projects/3401 or by phone at (323) 455-4585. The Dorie Theatre @ The Complex is located at 6476 Santa Monica Boulevard in Hollywood, 90038. 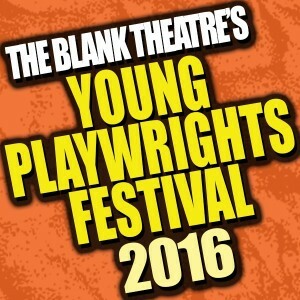 More than 40 actors have been set to participate in The Blank Theatre’s 24th Annual Young Playwrights Festival, including Angelique Cabral (Life In Pieces), Christoph Sanders (Ghost Whisperer, Last Man Standing), JR Bourne (Teen Wolf), Sharon Lawrence (NYPD Blue), Scott Lowell (Queer As Folk), Angel Parker (Lab Rats, American Crime Story), Lenny Jacobson (Nurse Jackie, Big Time in Hollywood, FL), and Jessy Schram (Nashville, Veronica Mars, Falling Skies). Twelve winning plays by young playwrights aged 16—19 from seven different states will be presented during this year’s festival at the Stella Adler Theatre in Hollywood, running from June 2—26. Other notable performers appearing in Festival plays are (in alphabetical order) Max Adler (Glee), Juliette Angelo, Cole Bernstein, Grace Bethany, Scarlett Byrne (Harry Potter, Falling Skies), Jake Cherry (Night at the Museum), Deborah S. Craig (The 25th Annual Putnam County Spelling Bee), Paul Eiding, Jen Eldridge, Chase Ellison, Julie Ann Emery (Fargo, Better Call Saul), Elisha Henig, Eric Ladin (American Sniper, The Brink), Casey McCormick Leach, Ethan Lee, Mackenzie Lintz, Oliviana Marie, Austin Mincks, Amir Mitchell-Townes (Girl Meets World), Eric Nenninger (Wet Hot Summer, First Day of Camp, Generation Kill), Lily Nicksay (Boy Meets World, The Blank’s A Singular They), Tim Peper, Cait Pool, Hannah Prichard (The Blank’s A Singular They), Sarah Jo Provost, Jazz Raycole, Jordan Rivera, Will Ropp, Sloane Morgan Siegel, Ben Stillwell (Teen Wolf, Murder in the First), Jennifer Stone (Wizards of Waverly Place), Kitty Swink, and Joey Voccia. 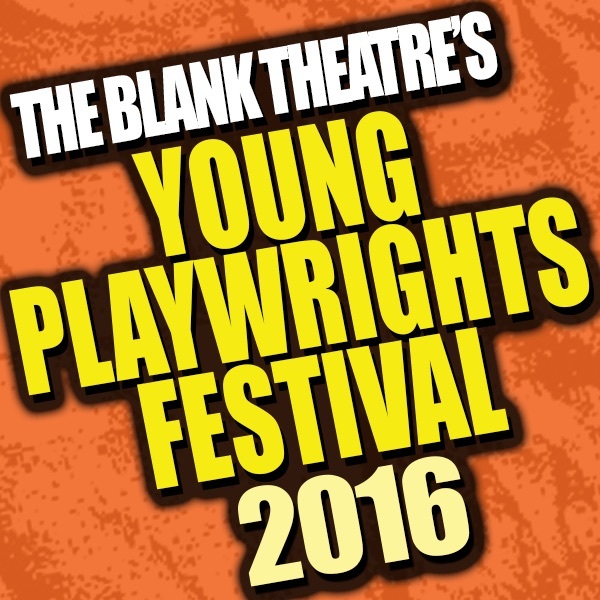 The Blank Theatre’s 24th Annual Young Playwrights Festival runs Thursday, Friday, and Saturday at 8pm and Sunday at 2pm, beginning June 2 and running through June 26 at the Stella Adler Theatre, 6773 Hollywood Boulevard (at Highland), in Hollywood. Each week’s program includes three plays. Tickets are $20 for adults and $14 for students. Festival Passes, which include one ticket for each week, are $68 for adults and $48 for students. Tickets may be purchased online at www.theblank.com or by calling (323) 661-9827. Gabriel Green (Mr. LA Leather Bear 2014) has announced BOYS WITH GUITARS 3 featuring singer/songwriters SEAN WOLF GALUSZKA, COLIN DEANE, SEAN FITZPATRICK, and jACE at Oil Can Harry’s in Studio City for one show only on Wednesday, May 25 at 8pm. BOYS WITH GUITARS 3 will also welcome special guest DON MIKE. Sean Wolf Galuszka is an actor and ASCAP Award-winning singer/songwriter/actor from Central NY. He recently returned from Ashland, OR, where he received rave reviews for his performance in Ring Of Fire: The Music Of Johnny Cash at the Oregon Cabaret Theatre. He appeared in the critically acclaimed PBS American Playhouse presentation of Miss Julie and appeared on ABC’s Miracles. 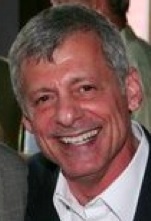 His Los Angeles stage work includes The Complete Works of William Shakespeare and An Appalachian Twelfth Night, among others. Galuszka’s irreverent country song, “Zombie Apocalypse Gay Bear Country Western Christmas Love Song” has garnered fans as far away as Australia and prompted him to record “Songs for Lonesome Gay Cowboys” — traditional country western music written for the gay community. Colin Deane is a native Californian who started singing in preschool and never stopped. He has studied many genres of music including opera and theatre. He continues to seek his own sound in the world of pop and works tirelessly to hone his skills. Deane is preparing to release some of his original music this year. Quite often he can be found at the local coffee shop — with his guitar, singing. Sean Fitzpatrick is best known for his explorations in electronic music, classical, jazz, and rock ‘n roll styles. Since the age of three he has been playing melodies in his head on multiple instruments. Current electronic band Creature is bringing him back to his piano roots, challenging sound and synth theory and being his primary musical focus. jACE is a Hip-Hop/R&B singer-songwriter from Suitland, MD. Born in the 90s stylings of Seal, Eminem, and Linkin Park he was raised through marching bands and the growing local hip-hop scene. After the inception of electronica and acoustic sounds for his demo EP ‘Coals’ he turned to the glitch-hop scene. As an LGBT advocate and active participant in the Leather community, the lyricism in his work reflects the balance of being honest and present. jACE also writes and produces for other artists. BOYS WITH GUITARS 3, featuring Sean Wolf Galuszka, Colin Deane, Sean Fitzpatrick, jACE, and special guest Don Mike, will play one show only on Wednesday, May 25 at 8pm, and there is no cover charge. Oil Can Harry’s is located at 11052 Ventura Boulevard in Studio City, 91604.